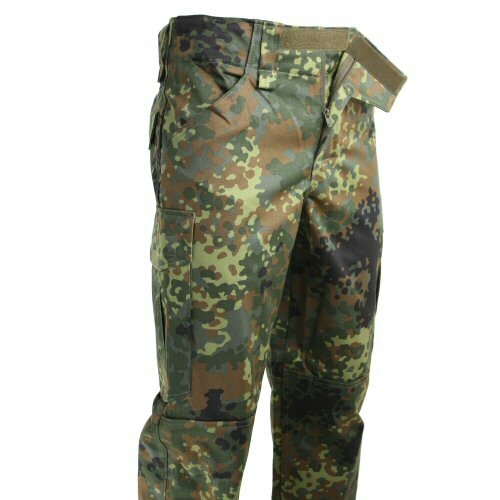 The LK explorer trousers, made in genuine German military Flecktarn camouflage, are a quality action trouser, sewn to under German quality control to military specifications and designed with special ops and law enforcement in mind. The trouser legs are panelled for better ergonomic performance over hips, seat and knees, whilst the lower hem is reinforced on the reverse side to reduce fraying and wear. 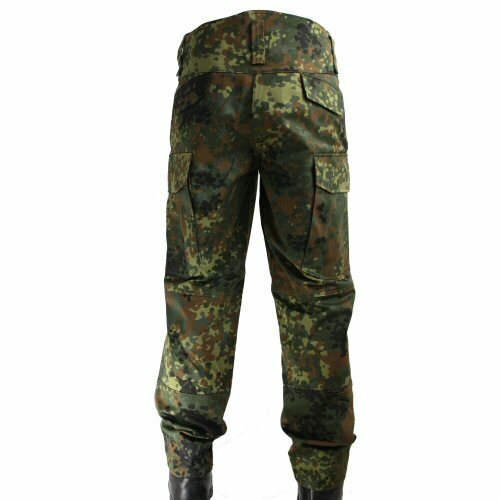 The leg cargo pockets are triple pleated and deepened to accommodate larger objects, and can both be opened from the top lid whilst standing or from the front seam with zipper whilst seated or mounted. The hip pockets are set at an angle to suit both top and side access. Pocket ends are reinforce stitched for durability. The seat pockets are set closer to the sides of the leg for easier access, and also to reduce contents being squarely sat on. The front waist is closed with extra long hook and loop for good adjustability within sizes, and the fly is military specification coil zip. The waist of the trousers is raised on the rear which helps to prevent belt bunching during crouching or squat movement. The extra panelled hips allow the trousers more room in the rear so they do not ride down as readily as standard trousers. The lower legs are straight cut, but not baggy so that there isn't extra fabric to flap about and snag when moving through low lying vegetation. 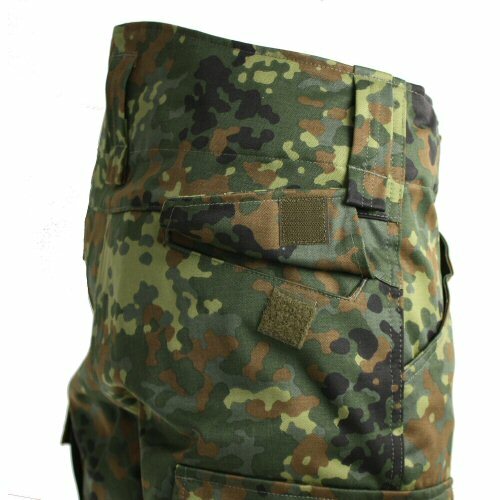 Made from authentic 5 colour Flecktarn interwoven fabric printed in Europe. 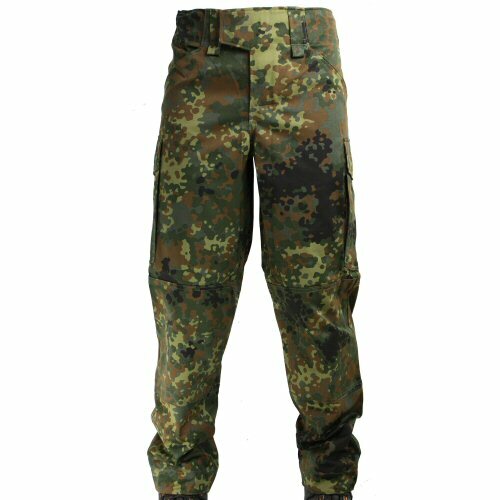 Sizes available are M (Euro48-50, 90cm waist), L (Euro 52-54, 100cm waist), XL (56-58, 110cm waist). The long velcro fly and reverse face zipper. Also shown are the extra length belt loops with attachment points for lanyards and carabiners. A closer view of the back pocket detail. This is set into an expansion dart for hip movement, and slanted toward the hip for easier opening when wearing bulky armour. 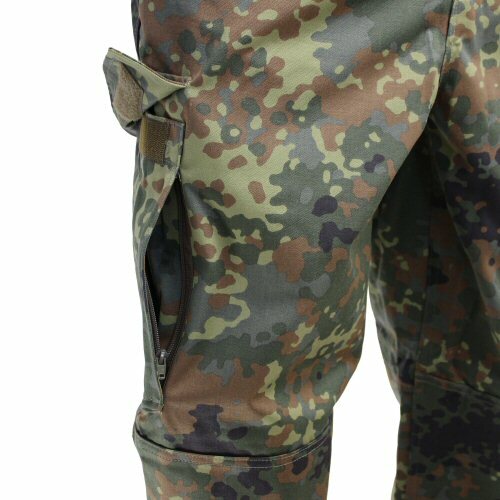 The front of the leg pocket has its own zipper for easier reach when seated. The rear view of the trousers, showing the raised back to reduce belt bunching and draughts.